In my classroom, literature circles are called "Book Clubs." The components of book clubs include choosing a book, reading the book, discussing the book, writing in your journal, and sharing the book by doing an extension project. 1. Setting the Climate: I choose a story from our anthology because I want everyone to read the same story to build a community of readers, and I also want to begin with an author/genre study. At the same time, I want to lay the foundation for literature circles. We read and discuss the story as a whole group. During the discussion, we practice using good listening skills, asking thoughtful questions and making appropriate comments. Then I provide several other book sets by the same author to extend the study. 2. Choosing Books: Book choice is important for successful literature circles. Good choices include fiction works that are highly descriptive and have excellent dialogue. The illustrations must make the text come alive. In non-fiction, authors must be skillful at conveying information clearly, and the books should have high-quality illustrations. Throughout the course of a year, I will offer a wide variety of materials which include a wide range of reading and interest levels. I choose books around a theme, an author or illustrator, or because of strong student interest. (Click here for Mary Lou's list of books). 3. FormingGroups: For the first session of literature circles, I structure the groups based on gender, ethnicity, class demeanor, teacher observation, and test scores to achieve a heterogeneous balance. Later in the year, students get to vote for the book they want to read after I do a book talk and they have had the chance to browse through the choices (Click here to learn more about students choosing books). The students mark their first three choices on a ballot and I try to give them their first choice. However, students understand that I may have to give them their second or third choice depending on the makeup of the groups. You can see that groups change memberships throughout the year. Most teachers I know try to keep the groups large enough to be interesting, but small enough to get good discussion going. I aim for four to six students in each group. 4. In Operation: Several groups then operate simultaneously. In primary grades, the teacher may need to stay with the groups. The timing of moving into literature circles and the teacher moving out of the leader's role depends to a large extent on the way the classroom climate has been established. I know I am ready to begin literature circles when my class deomonstrates good listening skills and the ability to work together more or less independently. 5. Scheduling: At first, the literature circle groups need direction in setting up a schedule, so we do it together. I may meet with two or three circles in one day and on alternate days they are doing their group reading assignment or writing in their journals. By and large, literature circles meet every few days for discussion. 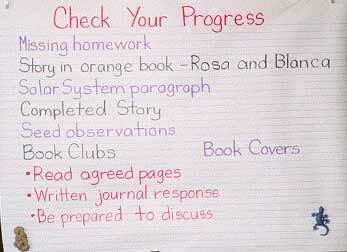 Each literature cirlce takes about three or four weeks from beginning reading to finishing the extension project. Literature circles take place during my language block, 9:20 - 11:00 every day. My daily schedule looks like this: Students look to the board for their morning work assignments which may include a missing homework, a science writing assignment, and any other special information they may need. As soon as they are finished with this work, they begin to work on their book club assignments. They do the work together or individually depending on what they have to do. I frequently do a "status of the class" check on a large sheet of graph paper. This helps me to know what everyone is doing, it helps the groups recall what they have agreed to do, and it helps individuals to get started and stay on track. 6. Extension Projects: This part usually takes about one week. The students choose their projects as a group or individually. They share their projects with the rest of the class or with a larger audience. (Click here for more ideas for Extension Projects).